Recently, my husband and I had the pleasure of vacationing on the French side of Saint Martin. While there, we immersed ourselves in island life and French culture. We swam in the pool-blue sea, watching small silvery fish swim past us. We enjoyed leisurely lunches of crusty baguettes, creamy cheeses and bright salads. We had dinner at local creole stands and fine French restaurants. We ate very well there, coming away from the experience feeling lighter, happier and totally changed. Vacations will do that. Vacations on French islands are an added bonus. I vowed to cook more French food when we got home. I wanted to continue their time- honored culinary traditions. I stuck to my promise. Our happiness continues, only by fireside instead of seaside. This is an Elizabeth David recipe that I made a tad bit lighter and easier to prepare. She calls for a teeny amount of grated nutmeg in her recipe which is wonderful. I suspect a small amount of ground cumin or some fresh thyme will work too. I use one percent milk and just a wee bit of light cream in the filling, instead of the suggested heavy cream. I also saute the onions in olive oil instead of butter. Elizabeth calls for 3 egg yolks to be used. I used 3 large eggs. These changes produce a lighter but very satisfying and creamy tart. It's well known that the French take immense pleasure in preparing and sharing meals. They enjoy savoring every delicious bite of thoughtfully executed food. There's usually some butter, a little cheese, some wine, maybe some fruit or a green salad at lunch or dinner. They love food, but in general, no one has a weight problem. The portions are not excessive. They rely on whole foods. Nothing is processed. Everything is cooked with reverence and care. The flavors of the food compliment, rather than compete with each other. At the end of the meal, the diner feels content and satiated not sluggish and heavy. 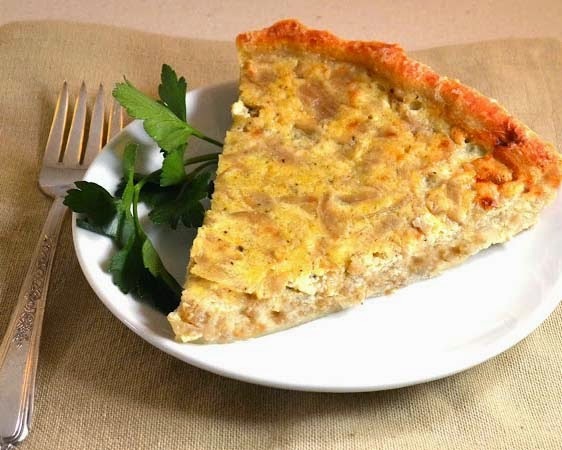 This onion tart is a classic example of the simple, straightforward approach to French cooking. A creamy, flaky tart is composed of just a few key ingredients. Everything works together to highlight the natural taste and sweetness of the onions. Don't be intimated by tart making. It's pretty easy. If I can do it, so can you! 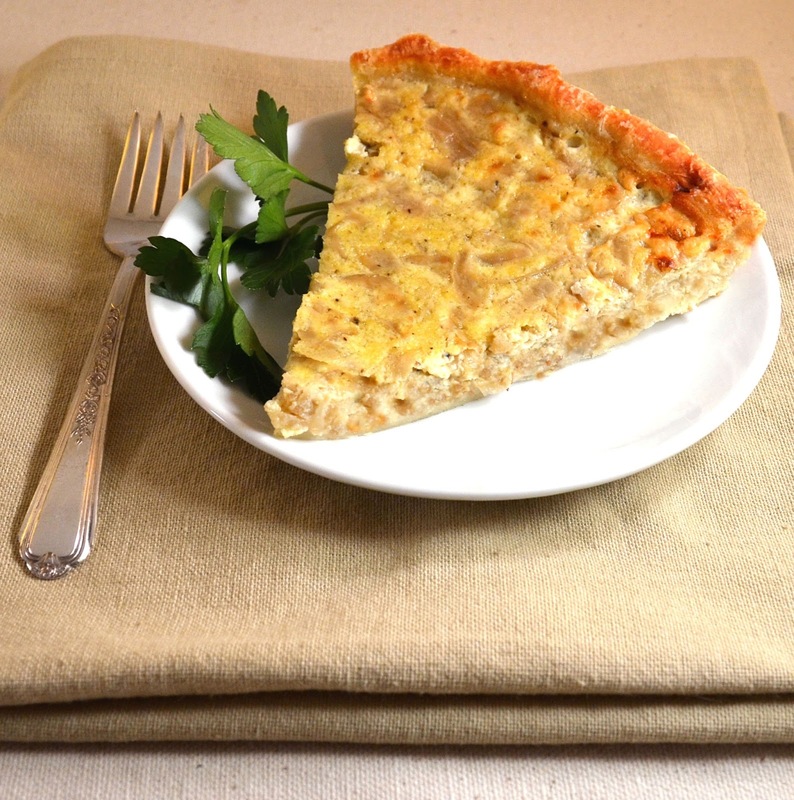 You can use the pastry recipe for all your quiche recipes too. 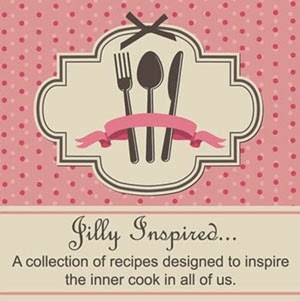 If you have a favorite pastry recipe then here's the place to use it. Serve this onion tart with a crusty baguette and a lightly dressed green salad for a filling vegetarian supper (French vinaigrette recipe below). Some ripe tomatoes dressed with a little olive oil and sea salt or some freshly roasted red peppers are also good side dish choices. This onion tart is to be served piping hot. This is easier to do if you get the ingredients ready well before hand. I saute the onions and make the pastry hours before I'm ready to assemble the tart, keeping them both in the fridge. The pastry should be chilled for two hours or more. The pastry dough can be kept in the fridge, well wrapped, for a few days. 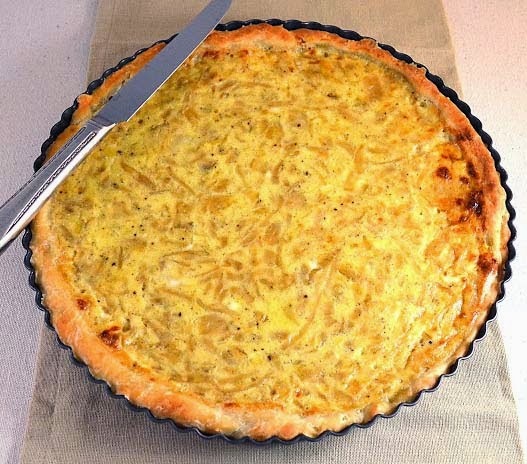 When you're ready to bake it, just roll out the pastry and place it in a tart pan (butter or oil the tart pan even though there's butter in the pastry) mix the ingredients for the onion filling and pour this mixture into the pastry-lined pan. Bake and serve hot. Voila! 3/4 cup all-purpose flour. I used King Arthur brand. Put everything in a food processor except the water. Pulse to combine. Add very little water, just enough to make the dough moist and whiz to just combine. Place the ball of dough on a floured work surface. I use a marble board for this. Knead the dough a little with the back of your hand. If you find that you've added too much water and the dough is too wet, just add some more flour. It should work out fine. Roll it in a ball, wrap it tightly in plastic wrap. Let it chill in the refrigerator for two hours or a few days. According to Elizabeth, it will loose all elasticity after being chilled and it won't shrink or pull away from the pan when baking. Peel and slice the onions as thin as possible. Add some olive oil to a fry pan and cook the onions, covered, until they are soft and pale golden. Stir frequently and keep a close eye on them. You don't want them to burn or brown or stick to the bottom of the pan. Season with salt, pepper, nutmeg, cumin or thyme. Let cool. You can store them in a air tight container in the fridge until you're ready to make the tart. When you're ready to bake the tart, butter or oil an 10 inch tart pan. Roll the pastry as thin as possible. Press it gently into the tart pan, folding and pressing any overhanging edges onto the sides and making sure there are no holes in the dough. Add the cream and the eggs to the reserved onions with a little more salt and pepper and mix to combine. Add this mixture to the prepared pastry-lined pan. Place the pan on a baking sheet lined with foil and bake in the middle of a preheated 400 degree oven for 25-30 minutes. Because all ovens are different, check after 20 minutes. Serve very hot. I've stored leftovers in the fridge. I heat it in the microwave. Not quite as good but still delicious. 2 tablespoons of Dijon mustard, 2 tablespoons of red wine vinegar or an aged balsamic vinegar, 6 tablespoons of best quality extra virgin olive oil, one scant teaspoon of minced shallot, a bit of fresh thyme (optional but good), a drizzle of honey, salt and pepper to taste. Whisk everything to combine. Toss into mixed salad greens.